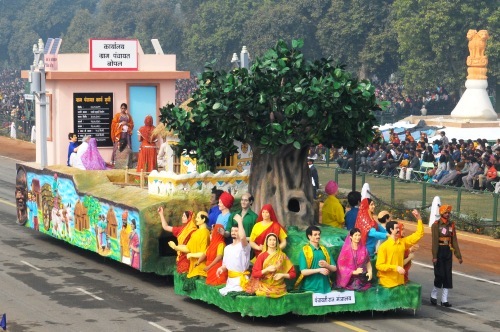 The tableau of the Ministry of Panchayati Raj at the Republic Day 2011 Parade. The 62nd Republic Day, celebrated today on 26th January 2011 was a symbol of harmony, self-governance, biodiversity and sustainable development that are inherent to the Indian culture. 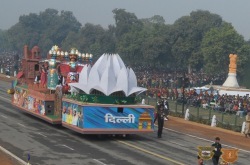 The Republic Day 2011 parade was well received by the President of India. The Indonesian President Susilo Bambang Yudhoyono was the invited Chief Guest. While the Indian defense forces impressed the spectators by demonstrating their might and discipline, the cultural aspect of the parade was equally enthralling. The tableau of the Ministry of Panchayati Raj brought forward the principles of local self governance by displaying the symbolic village tree which hosts panchayats across India. 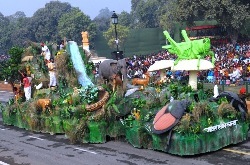 The tableau from the Ministry of Environment and Forests (MoEF) highlighted the theme of man’s harmony with nature which has been a characteristic of traditional Indian living. The tableau not only depicted the rich biodiversity of India but also illustrated traditional sustainable lifestyle of the people of India. The tableau of the Central Public Works Department (CPWD) decorated itself with tigers beautifully crafted from flowers and highlighted the cause of the dwindling numbers of the big cat. The participants of the tableau also carried banners which read “Baag Bachao” and “Save Tiger” in different languages. The Delhi tableau tried to capture the spirit of Delhi as the capital of the much diverse India, while capturing the reflection of this diversity on the the capital city. The tableau was kept simple though one would have expected the recent Commonwealth Games 2010 or similar feats to be represented. Perhaps the various controversies over its organizing in the city and the corruption issues that followed downplayed it all. Other state tableaux equally brought forward the unique culture of respective parts of India all of which beautifully put together the unity in diversity of the country. Delhi Greens wishes all its readers a very Happy and Proud Republic Day!